Hi everyone and Happy February! 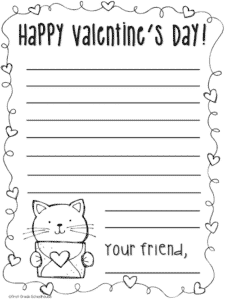 Here’s a packet of Valentine’s Day notes. Use these at your writing center to engage your students in writing notes to classmates, family, and friends. The writing papers have a Valentine’s Day/heart theme. Included are full page, half page, and quarter page sized writing paper. Each note includes a heart border, a valentine heading, and heart graphic. Copy the paper on an assortment of bright, colored paper. Use the notes at a literacy center, for guided writing, or as part of a Valentine’s Day thematic unit. Add a post office box to your writing center. It’s a fun way to encourage authentic writing.